Another good show to attend if you are in the Louisville, Kentucky area November 12-13, 2011. 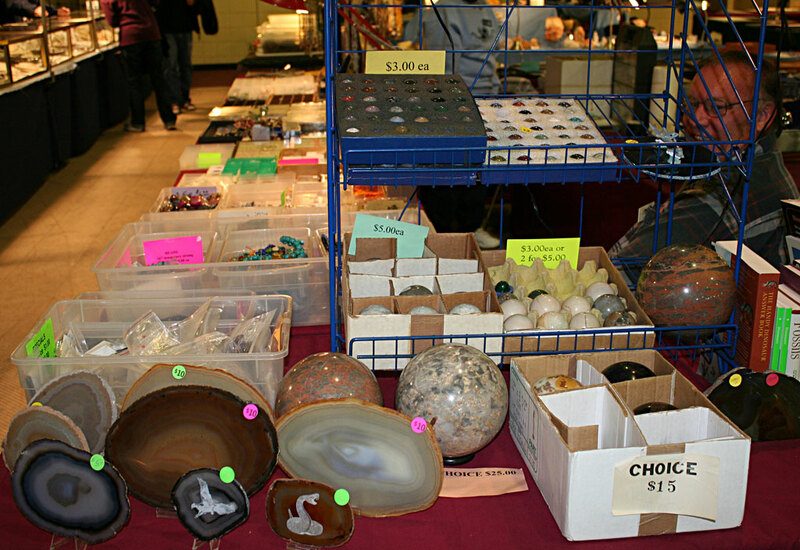 The gym of the Resurrection Lutheran Church was filled with tables selling minerals, jewelry, fossils, geology supplies, art, and holiday gifts. 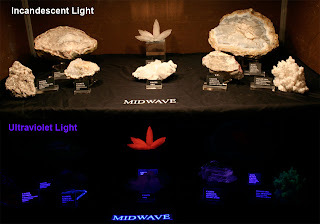 The main display attraction is a set of fluorescent minerals presented by Danny Settles of Danville, Kentucky. He had three custom cases with shortwave, midwave, and longwave UV fluorescent minerals. 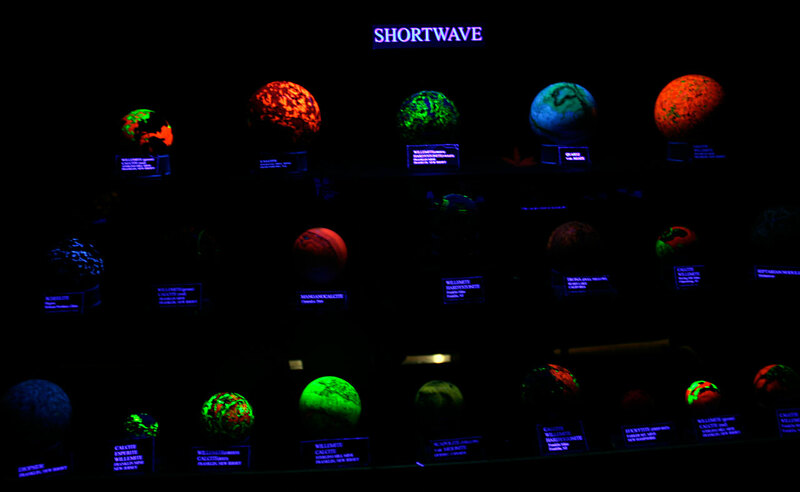 The cases were contained in a black curtain area with an illuminated green light button. Once the viewer pressed the button, the incandescent lights turned off the UV lights switched on. As Danny explained to me, the lights were custom made with a preheating system to extend the bulb life and cooling fans to keep the bulbs from getting too hot. After a fixed amount of time the UV lights power off and the white light returns. The longwave UV case had Weardale, England fluorite (blue-purple), North Carolina opal (green), Canada sodalite (orange), and I think fluorite China and Ohio. Not as familiar with midwave specimens but the red one is from Iran. 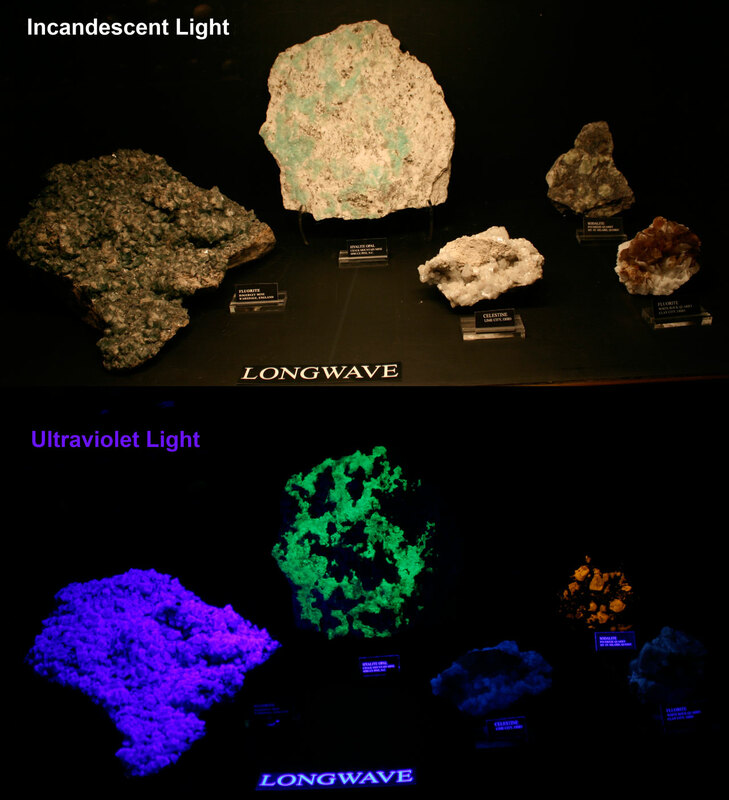 Shortwave UV specimens are of course dominated by Franklin/Sterling Hill, New Jersey. 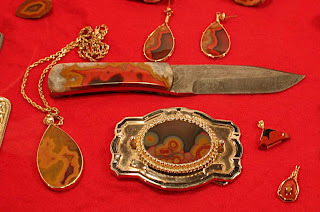 Another display case had a very interesting knife with what looks to be an agate handle and meteorite iron blade. The next picture shows what appear to be cut and polished Kentucky agate specimens. I met a number of friendly dealers and members of the KYANA Geological Society of which I belong. Since I also maintain the web site I tried extra hard this year to get names of people and companies whose material was at the show I was taking pictures of. Unfortunately, I ran out of time and did not get to see every table at the show but the following is a sampling of people I visited with. 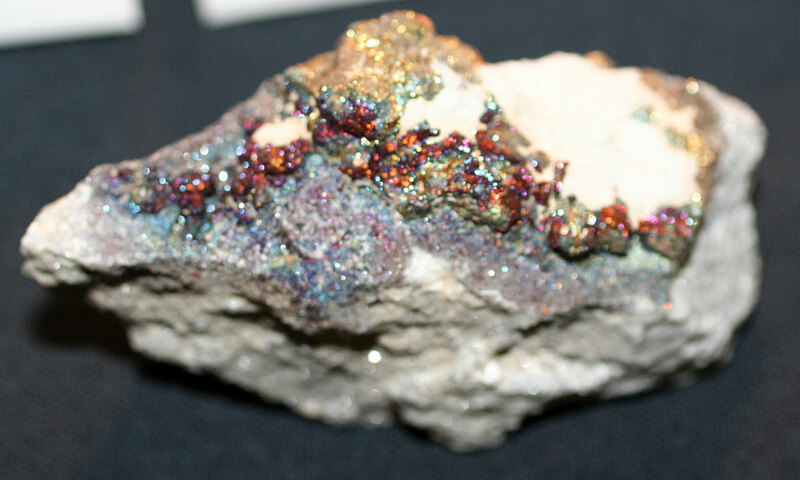 Two dealers I do not believe I encountered before were nice enough to chat with me. John LaMont traveled to Louisville from Brookville, Indiana and runs Lamont's Rock Pile (Jewelry, Carvings, Fossils, Slabs, Cabs, Misc.). He had some appropriate carving of horses which I thought were very nice. 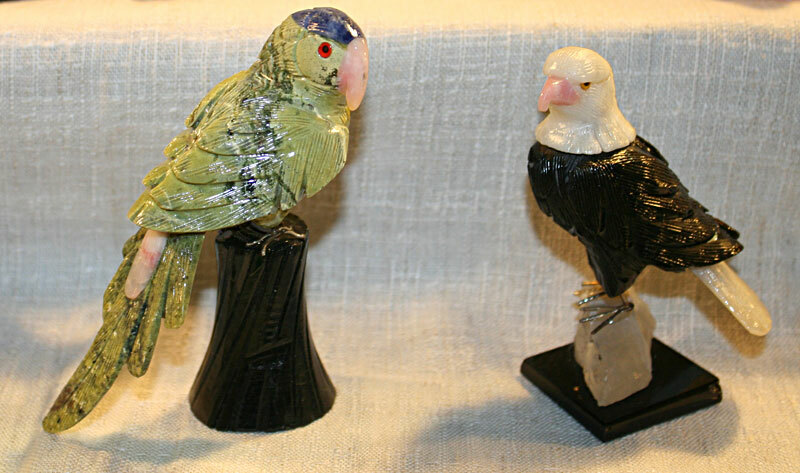 Also on display were a parrot and eagle. In addition, he had a variety of Ordovician trilobites from Ohio (Flexicalymene), fish from Wyoming, ammonites from Madagascar, cephalopods from Morocco, and trilobites from Utah. 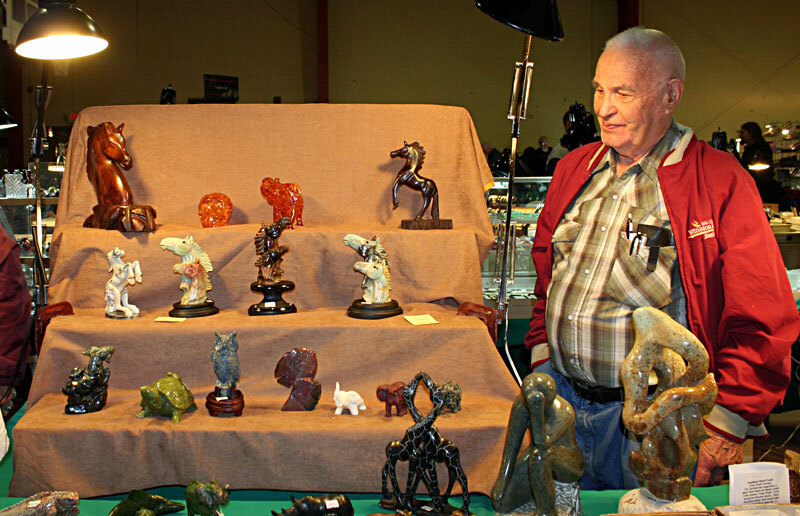 A dealer I believe is new to the Louisville show but a veteran of show circuit is Mark Palatas. 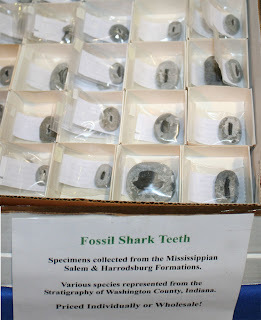 He had a large selection of Paleozoic shark teeth. 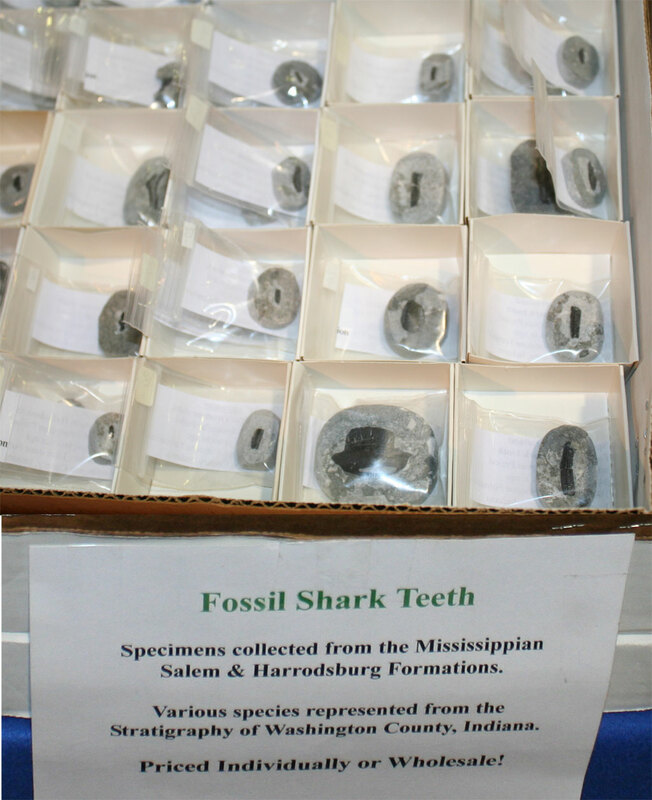 In addition, a good selection of Waldron Shale fossils which I enjoy studying. 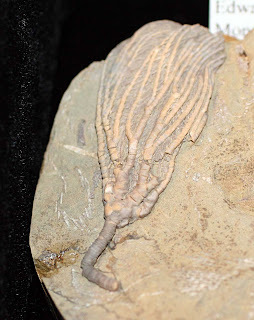 The following pictures of the Indiana crinoid calyx and Paciphacops Oklahoma trilobites also below to him. 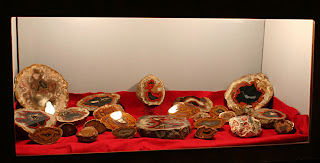 I encountered long time KYANA member and dealer Bob Robinson selling polished spheres and slabs. 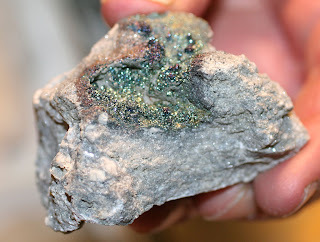 Long time mineral and fossil dealer Alan Goldstein had some very nice iridescent pyrite specimens from Kentucky for sale. Panoramic image of the show floor taken 11-11-11.